The versatile Oyster 3 can be used from birth, thanks to its full lie-flat recline (which can be used whether the seat is positioned forward facing or parent-facing on the chassis and the leg rest can be adjusted too- ideal for naptimes. Keep your little one strapped in safely using the 5-point harness which features softly padded shoulder pads and a headrest for further comfort. You can keep your little one safely out of harmful sun's rays with the large canopy. It features UV50+ protection, a pull-out sun visor and even a zipped extension to the canopy for when further cover is needed. A ventilation net in the canopy ensures good airflow on those warmer days and an insect net is hidden in a small pocket underneath the seat's footrest so your little one can travel comfortably. The canopy can also grow as your child does- simply press the release buttons in and you can adjust the height of it and the harness on the chassis without having to rethread the straps. This plus the newly designed strong chassis means that the Oyster can be used all the way up to 20kg for superb longevity and great value. 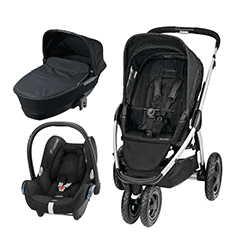 The seat unit can be removed easily and reversed on the chassis, or replaced with the Oyster 3 Carrycot or an Oyster Carapace i-Size infant carrier (sold separately) for when you want to turn it into a 3-in-1 travel system. 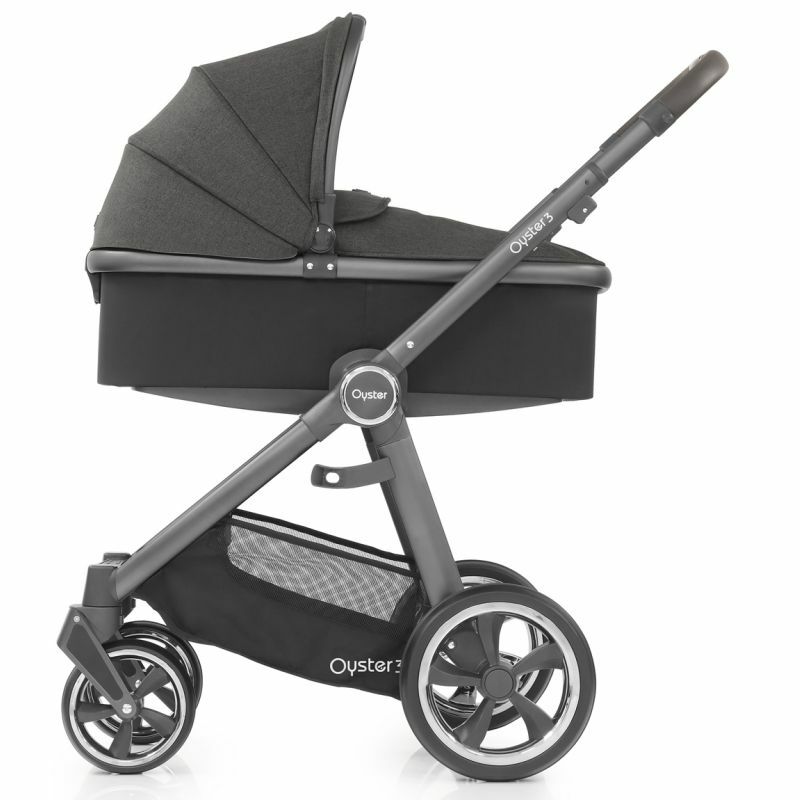 You can fold the Oyster 3 with the seat in place using an intuitive system and folds extremely compactly for a pushchair of its size. When folded, the chassis auto-locks for your convenience and free-stands- great for storage and a pull-out handle makes it easy to transport the pushchair. Underneath the seat is a large shopping basket- combined with the extra height from the seat sitting higher on the chassis, and with a separate pocket inside so you can stay organised, you can take everything you need along for the ride. The chassis of the Oyster 3 has been beautifully designed with large, turbine-style wheels with ER-foam tyres which are not only durable and suitable for off-roading, but are also puncture-free! The wheels have a soft suspension to make the ride less bumpy, and the front wheels can be set to swivel for nipping through city streets or locked forwards for straight line trekking- great for rougher terrain. A brake at the back keeps you stopped when you need it. For your comfort, the handlebar is telescopic so can be adjusted for parents of any size- the hand-stitched handlebar is also covered with the same soft leatherette as the bumper bar. 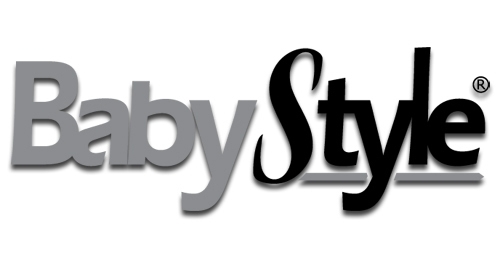 Babystyle Oyster 3 Carrycot designed to match or contrast with your Oyster 3 Stroller and turn it into a 3 in 1 pram. 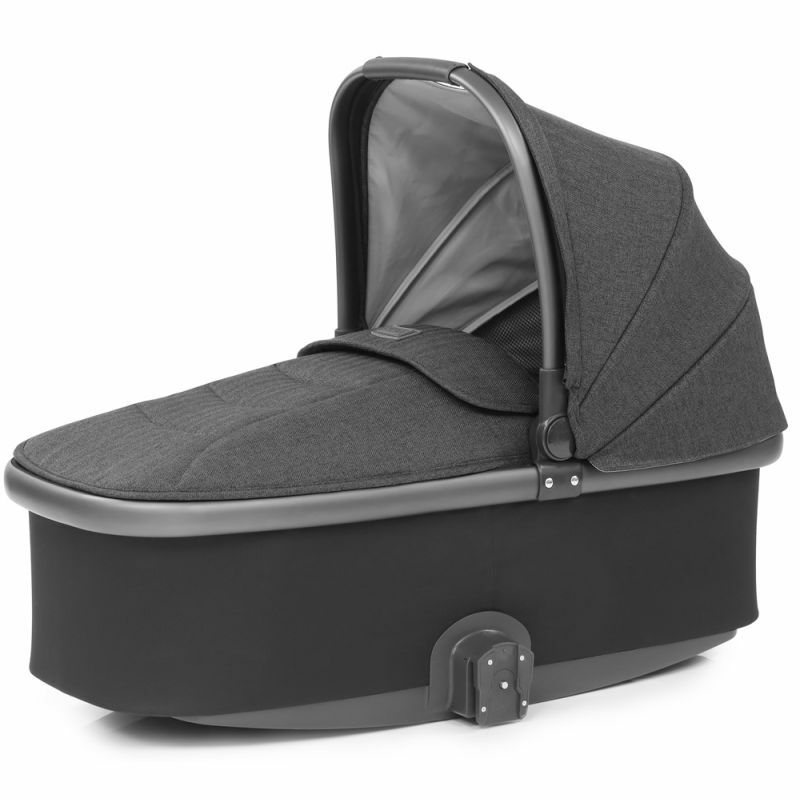 The carrycot is suitable from birth and has a lovely comfy mattress so baby is cozy and snug. 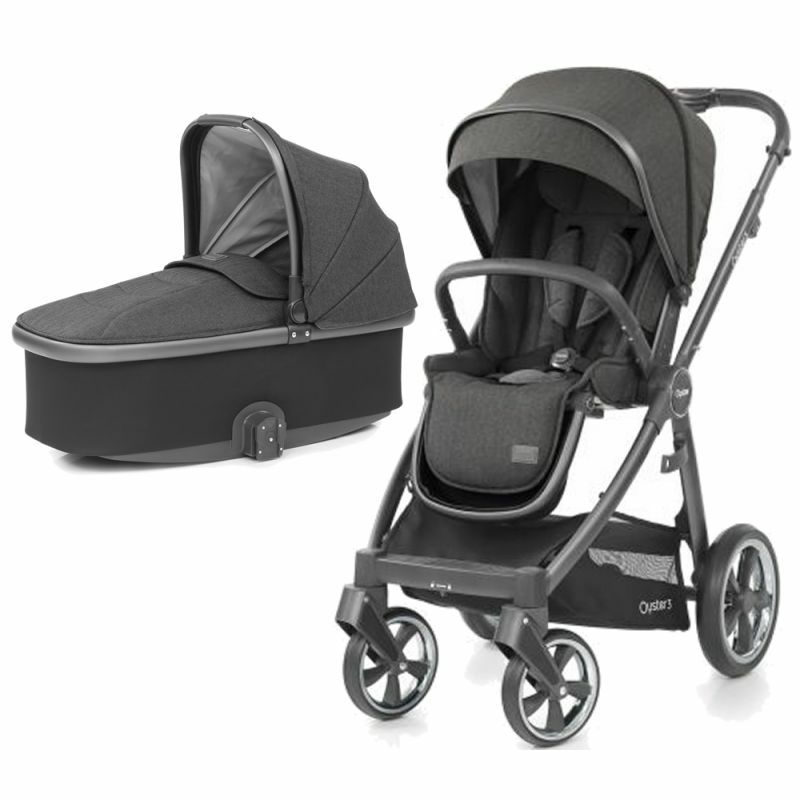 Complete with hood , apron, raincover and mattress the Oyster 3 carrycot is perfect for you and baby for a great start in life together. 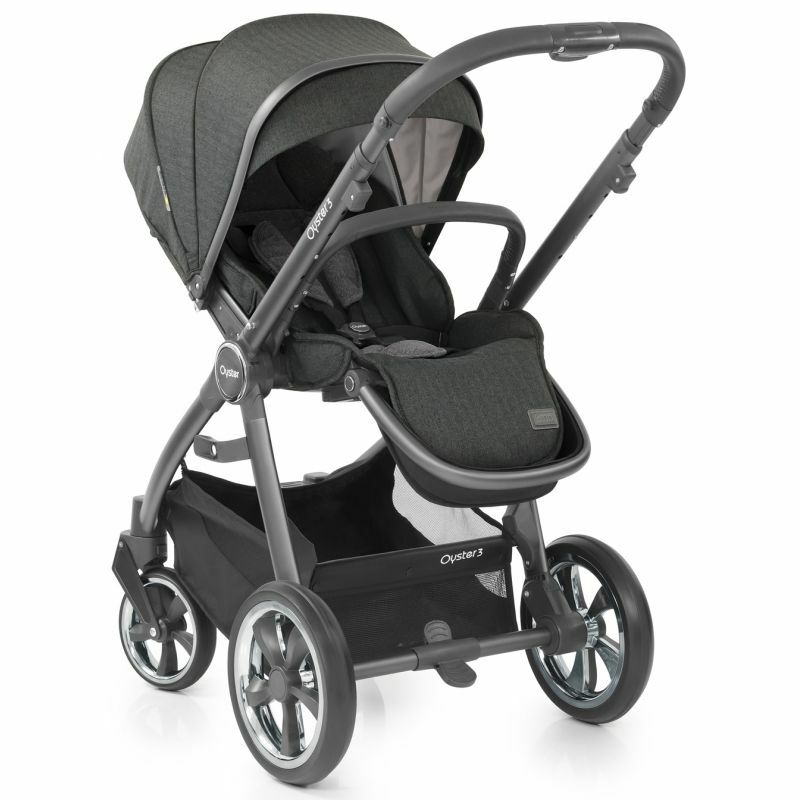 Available to match your Babystyle Oyster 3 City Grey or Mirror chassis.